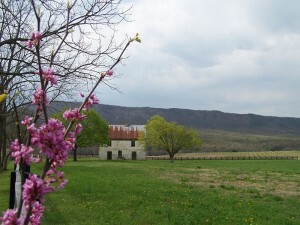 Redbud Flower Show – Coming Soon! Get ready, the biggest flower show in the Shenandoah Valley is coming! It is held on the flanks of Shenandoah National Park, in the hollows of the George Washington National Forest and everywhere else where there are swaths of native vegetation. Best of all, it is free and can be enjoyed from your car (but experienced even better by donning a pair of hiking boots and hitting a mountain trail). Even though winter is lingering this year, soon color will be returning to the forests and the stars of the grand flower show are drifts of white dogwood blossoms often intermingled with bright, lavender-pink redbud blooms. 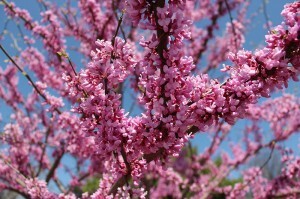 Cercis Canadensis or redbud is considered a large shrub by some and a small tree by others. It thrives in a variety of locations from drier roadsides to riparian areas adjacent to streams. Featuring spreading branches and a twisted trunk, it reaches 15 to 40 feet in height. According to Steve Brill on the app ‘Wild Edibles’, ‘the flowers impart a delicious, sweet-sour flavor with an overtone of fresh snap peas, plus a gorgeous color, to salads and a large variety of cooked dishes. You can toss them into oatmeal when it’s finished cooking, add them to pancake batter to make fritters, put them in bread dough, or use them in ice cream where they make terrific sprinkles. Freeze them with water in ice cubes and serve them in drinks or use them in wine making’. The botanary lists the word cercis coming from the Greek kerkis meaning weaver’s shuttle which refers to the shape of the seed pods. Canadensis means coming from North America or Canada. Another characteristic that makes redbud an attractive addition to the landscape is its heart shaped leaves that develop after the spring profusion of blooms. A few hybrids are well known including ‘forest pansy’ with its striking dark purple leaves. However, as Doug Tallamy writes in his book Bringing Nature Home, the hybrids don’t necessarily support local wildlife like the true natives. He notes that the butterfly Henry’s Elfin (Callophrys henrici) is the only one known to use the redbud as a host plant (p 319). 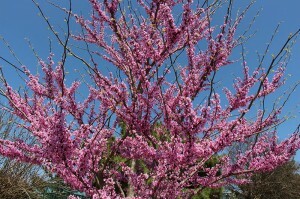 With its four-season interest, the redbud makes a nice addition to any landscape. Its small size allows it to be planted in a variety of locations and it serves as a nice backdrop or specimen plant.